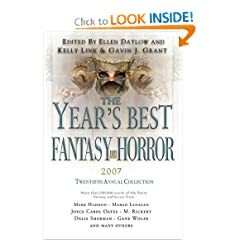 The Year’s Best Fantasy and Horror 2007, edited by Ellen Datlow, Kelly Link, and Gavin J. Grant. This series has long been hailed as vital reading for connoisseurs of short speculative fiction. The 2007 edition, which is the twentieth in the series, headlines Joyce Carol Oates, M. Rickert, and Gene Wolfe, and clocks in at more than 250,000 words (452 pages). I am glad to report I enjoyed most of the stories in this volume and only failed to finish a handful*. …on Esquire’s website. It’s called April 20, 2008. We should have linked to it earlier, but were too busy with the mad edits on Wikipedia. There are a number of fun Ben-techniques on display here, and I thought I noted a line/theme/move or two from the old workshop days. I was also immensely pleased to note Google Ads for ‘Floor Steamers’ and ‘Toenail Fungus Cure’ on the story’s sidebar pages. Click over and read! That link, once more. …for Science Fiction, Fantasy, and Horror, aka the grand triumvirate of speculative fiction. The question posed over at the SF Signal: Is the Short Fiction Market in trouble? The pros chime in, and a few editors respond in the comments below. In terms of financial viability for the traditional print magazine, most seem to think the answer is yes. It’s the same old same old of high costs, an aging subscriber base, and competition for the entertainment dollar and attention span. Several of the writers point out that payment for short stories has essentially stagnated since the 1930s and no one is making their living writing shorts any more. Some of the other comments point to no. The reason, of course, this interweb thingie (thanks again Al!) with all the e-zines and sites, as well as a greater number of quality anthologies (think Best of… and Themed works). Not to mention all the new writers who have more niches and opportunities to fill. (I would add, this applies as long as you are writing shorter short fiction). This short story is part cyberpunk mystery, part bio-tech horror. 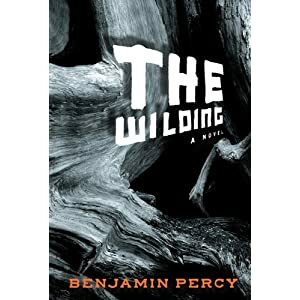 It was originally written for creative writing workshop at SIU, which seems like a long time ago, and has since undergone numerous revisions. The protagonist, Clay, has gone from utter clueless jackass to somewhat naive but (hopefully) sympathetic virtua-loving dude. See what you think. And while I like the sci-fi/space expo goodness of the Fusion Fragment visual theme, if anyone would like to read Argonaut in good old fashioned black-text-on-white-background, let me know. And have a look at Fusion Fragment’s other featured stories: ‘Sometime After’ by Krishan Coupland and ‘Life Without Crows’ by Gerri Leen.